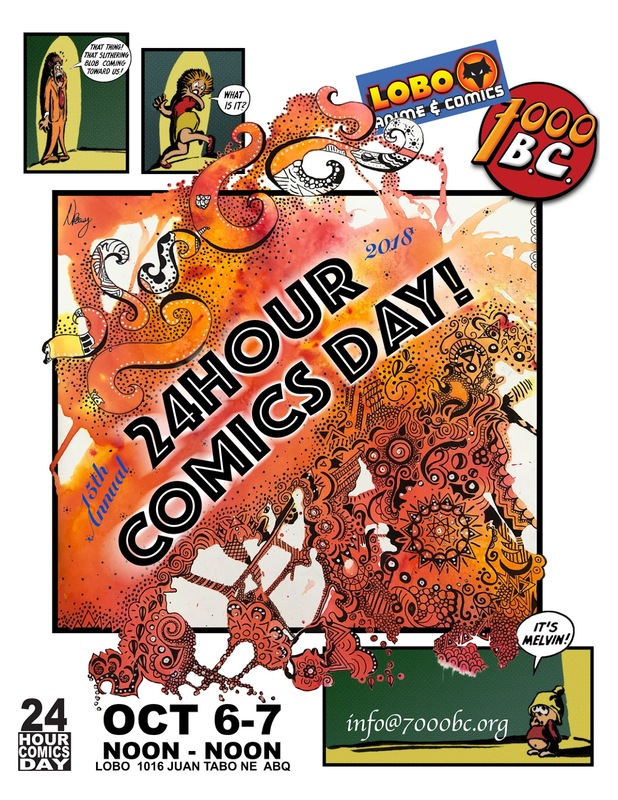 Be a part of 24-Hour Comics Day 2018 — accept the challenge to create 24 comic book pages in 24 consecutive hours. Join 7000 BC at Lobo Anime and Comics for a creative exercise that will test your stamina while you explore what you're capable of. Once again thousands of artists of all skill levels around the globe take part in this annual celebration of comics creation — everyone, regardless of experience in comics-making, is welcome, so bring your papers and pens, enjoy coffee from Winning Coffee, and join in. This event is open to all ages (with parental permission for minors) and is free. Pre-registration is not required, but it's helpful — if you know you're going to participate, please send an email. It'll be extra helpful if you can complete and return this form when you email or when you show up at the event. We're also looking for sponsors to donate food, drink, and prizes. Please get in touch if you're able to donate or help us find donations. Update 1: Jeff is liveblogging the event at the 24-Hour Comics Day site.